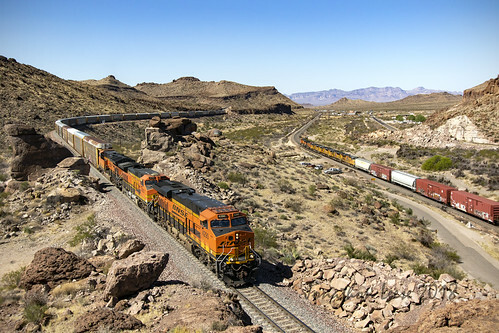 Railroadfan.com • View topic - BNSF , Kingman Az. I moved this past spring and settled in SW corner of Golden Valley AZ. My house sits high up next to base of the mounains and looking SE I can see The Mainline over 12 miles away. A train looks like a line of army ants from that distance. Now I need to get a 100x spotting scope. Re: BNSF , Kingman Az. The area around Kingman is great for railfanning. If you haven't yet, check out Kingman Canyon! The Seligman Sub is God's, or (insert higher power/being here) Country. This place is a mile from downtown, my wife and I often relax there and see multiple trains on both tracks. Recently we saw a unit grain train that was odd in that it had 4 units on the front, 3 in the middle and 2 in the rear. All intermodal have at least 3 units in front with 4 or 5 common and occasionally 6 , but 9 units was very uncommon. I will try and get pics transferred to my computer so I can post them. Note to all, if you want to visit this area, be aware there are rattlesnakes in the area, not something to worry about but something to be aware of.